The question is, How much of the country do Talabani and the Kurds want to reshape? The Kurds are holding out for at least six Cabinet posts, including head of the crucial Oil Ministry. They also say they are owed money from the U.N.'s oil-for-food program. A U.N. spokesman told TIME that $3.7 billion in Kurdish money was handed to the Coalition Provisional Authority. So far the Kurds have collected about $1.4 billion of that. They also want assurances that the Kurdish-dominated north will retain the autonomy it has enjoyed since the end of the first Gulf War, when the U.S. established a no-fly zone to protect the Kurds, and that the new Iraqi constitution will not impose Islamic law, as some prominent Shi'ite clerics have demanded. It's a testament to Talabani's knack for survival that he not only managed to elude Saddam's forces but also is now poised to assume the job of his former nemesis. A coalition of Kurdish political parties, which Talabani helped lead, came in a strong second in Iraq's national elections, winning 75 of the new Assembly's 275 seats. That gave the Kurds, who make up 17% of Iraq's population, enough clout to demand top jobs in the new government. While the victorious Shi'ites last week tapped Ibrahim al-Jaafari for Iraq's most powerful position of Prime Minister, Talabani, 72, has emerged as the most likely successor to Saddam as Iraq's President. And though the post is intended to be largely symbolic, Talabani plans to use the position of titular head of state to protect Kurdish interests. "I must have the right to participate with the government in ruling the country," he told TIME in an interview at his headquarters in the northern Iraq mountain stronghold of Qala Chwala. "We want to be partners in reshaping Iraq." The question is, How much of the country do Talabani and the Kurds want to reshape? The Kurds are holding out for at least six Cabinet posts, including head of the crucial Oil Ministry. They also say they are owed money from the U.N.'s oil-for-food program. A U.N. spokesman told TIME that $3.7 billion in Kurdish money was handed to the Coalition Provisional Authority. So far the Kurds have collected about $1.4 billion of that. They also want assurances that the Kurdish-dominated north will retain the autonomy it has enjoyed since the end of the first Gulf War, when the U.S. established a no-fly zone to protect the Kurds, and that the new Iraqi constitution will not impose Islamic law, as some prominent Shi'ite clerics have demanded. 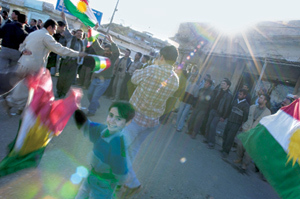 But some Kurdish ambitions could trigger ethnic disputes that would reverberate beyond Iraq's borders. The Kurds' election success has emboldened those who want to expand the southern boundaries of Kurdistan to include Kirkuk, the oil-rich city that is home to Kurds, Arabs and Turkomans. For U.S. officials, the nightmare scenario is that the Kurds break away from Iraq altogether--splintering the nation and inciting restive Kurdish minorities in such neighboring countries as Iran, Syria and especially Turkey, which has threatened to intervene to prevent the establishment of an independent Kurdish state. In his interview with TIME, Talabani played down the possibility of Kurdish secession. "If you asked the Kurds, 'Do you want independence?' of course everyone will say yes," he said. "But if you ask, 'Do you want independence now?' the answer would be no." A U.S. official says Talabani, a former lawyer with close ties to Washington, "knows how far he can push, and he's not likely to push further than that, even if a lot of Kurds want him to." There's little dispute that the results of the Jan. 30 election have given Kurdish nationalism fresh momentum. Although they are predominantly Muslim, the Kurds of Iraq have long favored a more secular form of government than most Shi'ites do. The Kurdistan Referendum Movement, a grass-roots organization of intellectuals and junior political officials, says that of the 2 million who took part in an informal Election Day referendum on independence, 99% voted in favor. Kurds control their peshmerga militia soldiers and their own borders and are determined to preserve their sanctuary. Officially, Kurdistan exists only north of the "green line," the area where U.S. forces halted the Iraqi army's advance when Saddam moved to crush yet another Kurdish uprising in 1991. But since the fall of Saddam in 2003, the size of Kurdish-held territory has expanded 20%, according to coalition officials in northern Iraq. Kurdish leaders are pushing to gain control of Kirkuk--known as the Jerusalem of Kurdistan--the capital of one of Iraq's most productive oil regions. Under Saddam, Kirkuk was subjected to a massive demographic reordering, as Saddam moved large numbers of Arabs into the city and tossed many Kurds out. The interim Iraqi government headed by Prime Minister Iyad Allawi agreed that Kirkuk should be normalized--meaning displaced Kurds would be allowed to return while the so-called new Arabs would be moved out and compensated. But though some 100,000 Kurdish refugees returned to Kirkuk in time to vote in the election, the Iraqi government has yet to begin deporting the new Arabs. For U.S. commanders in Iraq, an even more pressing concern is the status of the 80,000-strong peshmerga. In insurgent hot spots like Mosul, U.S. commanders have praised Kurdish troops for their willingness to stand and fight. But the peshmerga's continued assaults on insurgents run the risk of exacerbating tribal rivalries and sparking an anti-Kurdish backlash by Iraq's Arabs. The U.S. hopes to defuse the potential for conflict by folding the peshmerga into a new, unified Iraqi army. But the Kurds have so far refused to place their soldiers under the command of Baghdad. "The peshmerga must remain a force of the regional government," says Talabani, a former peshmerga commander. "The Kurdish people need them as protection against terrorism and to secure the boundaries of Iraqi Kurdistan."